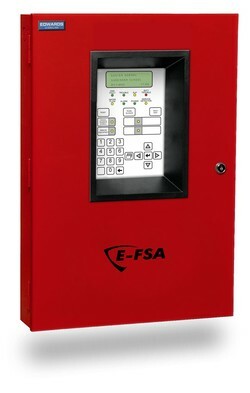 Note: The E-FSA64 has been replaced by the FX-64 intelligent addressable panel. The Edwards Signaling E-FSA64 life safety system offers the reliability of analog/addressable fire detection for small to mid-sized applications. Built to provide years of trouble-free service, this system benefits building owners and installers with rotary device addressing, optional Ethernet® connectivity, and a full line of easy-to-configure option cards and modules. The E-FSA64 provides one Class B analog/addressable device loop that supports up to 64 device addresses, and two Class B Notification Appliance Circuits (NACs). Optional Class A device wiring is available with the use of a module. The E-FSA64 life safety system is a reliable analog/addressable solution for small to mid-sized buildings. Analog/Addressable Technology delivers the benefits of flexible system installation, while a clean and easy-to-operatate user interface makes panel operation and system maintenance quick and intuitive. The inherent fault-tolerant characteristics of Analog/Addressable Technology boosts the reliability of E-FSA64 systems. When combined with E-Series smoke and heat detectors, this system delivers a level of dependability not previously available for small to mid-sized applications. All E-Series systems are built to exacting Edwards reliability benchmarks and meet ISO 9001 standards for quality, in addition to agency listings for dependability. The E-FSA64 is particularly well-suited to retrofit applications. All connections are made over standard wiring – no shielded cable required. This means that in most situations existing wiring can be used to upgrade a legacy control panel to E-FSA64 technology without the expense or disruption of rewiring the entire building. E-FSA64 NACs are configurable to fully support Edwards notification appliances. These devices offer precision synchronization of strobes to UL 1971 standards. Enabling this feature allows connected horns to be silenced while strobes on the same two-wire circuit continue to flash until the panel is reset. Remote annunciation is a strong suit of the E-FSA64. Up to eight annunciators can be installed on a single system. Compatible annunciators include a range of LED and LCD models that provide zone or point annunciation, as well as common control capabilities. The E-FSA64 also supports graphic annunciation with optional RA Graphic Annunicator interface modules. Each interface provides common control, indicators, and 32 LEDS. The E-FSA64 life safety system is supported by a complete line of analog/addressable detectors, modules and related equipment.